Races at Valencia are boring, right? No one can pass there anyway. You can't win a Grand Prix these days unless you start at the front, certainly not at Valencia. Fernando Alonso starts eleventh on the grid? No hope from there. Certainly if it doesn't rain. He said so himself. Indeed, he said not even a podium is possible. 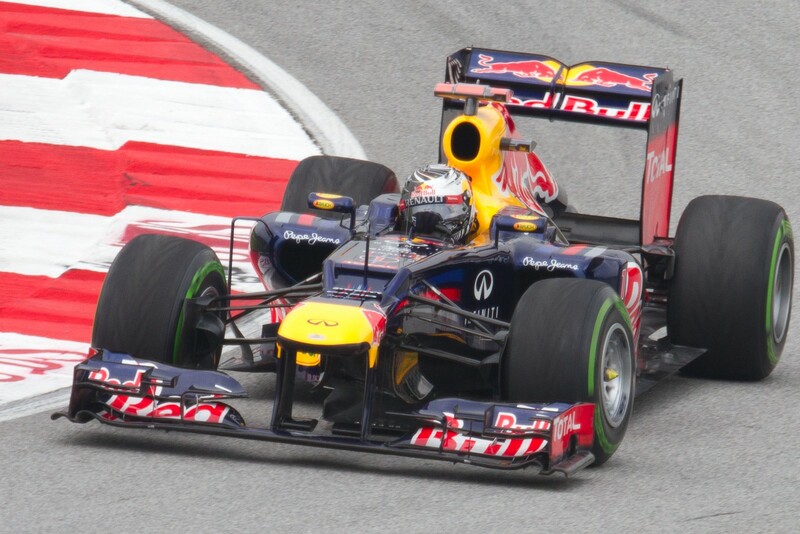 And he can't rely on attrition; modern F1 cars almost never break down. Well never let it be said that in F1 things can be foreseen with confidence; all of these things turned out to be wrong today. Whatever ration there is for exciting Grands Prix at each venue was clearly saved up by the Valencia street track for each of the last four years and all dispensed liberally in the race this afternoon. In the most unlikely of locations we were treated to an improbable and incident-packed race, even by the exalted standards of the 2012 season. For much of the way you didn't know where to look, such was the concentration of things happening. And at the end of it all home hero Fernando Alonso took the flag first, after a combative and rapid drive up from what looked a forlorn 11th place on the starting grid, a performance that must be among even his very best ever. There was not a dry eye in the house. Of course, eight rounds in it ends the unprecedented run of no driver winning more than one race this year, but such was the quality of Fernando's drive I will forgive him for that. And on a day that closest championship rivals Lewis Hamilton and Sebastian Vettel didn't score he now leads the drivers' table by a clear 20 points. It also, curiously, is the first home victory for an F1 driver since Felipe Massa took the Brazilian Grand Prix in 2008. For much of the proceedings in Valencia today such a race, and such a race outcome, seemed a world away however. Pole-sitter Sebastian Vettel led from the off and scampered into the distance: 1.9 seconds clear after one lap, 8.5 seconds clear after six, and eventually in the region of 20 seconds clear of the next guy after the first stops. This was a rout, the like of which we'd grown ever so used to last season. As expected, the Lotuses looked most likely to have the legs of him (if anyone did), but it took Romain Grosjean many laps to clear the much slower Lewis Hamilton to get into second place (and Kimi Raikkonen was even further back at that point). By the time he did this it looked like Seb had a decisive advantage, and in any case it wasn't clear the extent, if at all, that Romain could lap quicker than Seb was. But the whole race changed with a safety car period, brought on by a particularly ham-fisted piece of driving by Jean-Eric Vergne. 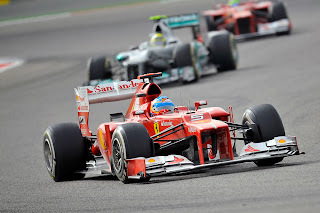 It put Grosjean right onto Seb's tail, and by this time Alonso had made his way up to third place. Just like in Monaco Alonso started quietly before moving forward just before the first stops. He moved past Nico Hulkenberg and then Pastor Maldonado, cleared Kimi in the stops, and then leapfrogged Lewis Hamilton in the second round of pit stops which were done under the safety car, after the nth dud pit stop of the year by the McLaren team. Still, it looked like the fight for victory to the end would be Seb vs. Romain, with the Lotus's much-vaunted pace and ability to look after its tyres finally getting its acid test. But within a lap of going green that also all changed: Alonso mugged Grosjean at the restart to claim second, and then within half a lap Vettel slowed and stopped with a dud alternator, thus putting Fernando into a lead he wasn't to lose. Grosjean still looked quicker than Alonso, and most expected his Lotus to hold onto its tyre life for longer than the Ferrari, but passing the Spaniard has never been the work of a moment and no more stops were planned. However, a few laps later the matter was resolved early when Grosjean's alternator went the same way as Vettel's (perhaps a rogue batch there from Renault). 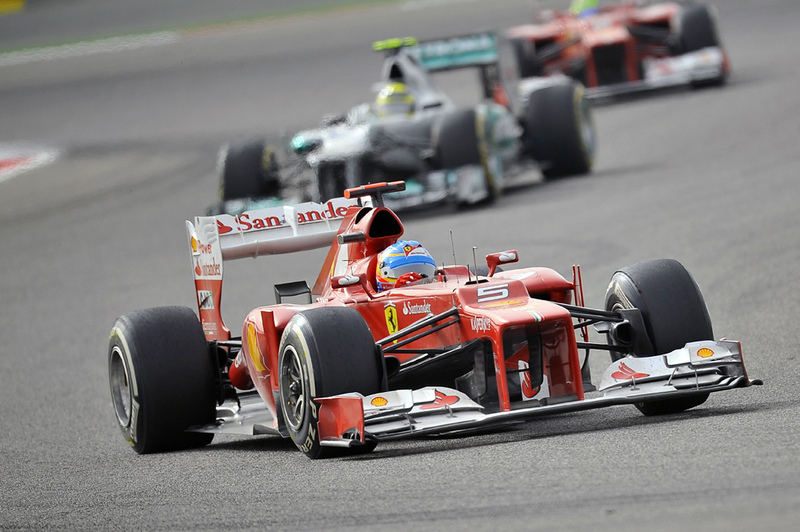 Alonso then was pretty much home and hosed, his only consideration being stretching out his tyre life to the finish. It helped that Lewis Hamilton in second, having a determined race in a car that never seemed up to the challenge, was keeping Kimi away from his gearbox. Kimi cleared him late on after Lewis's tyres 'hit the cliff' but by then there wasn't nearly enough time for the Finn to begin to bother Fernando for first place. Indeed, Lewis lost everything before the end after a collision with Pastor Maldonado on the penultimate lap as both disputed third place. The clash put Lewis into the wall and left Pastor, shorn of a front wing, to hobble in tenth. What blame there was for the clash in my view is mainly with Pastor, his move was clumsy and he probably should have appreciated that he was never going to have much steering while straddling the kerb and thus yielded and sought to pass later. Still, Lewis was rather robust in his defence and his efforts in keeping the Williams were probably an exercise in futility given the extent that his tyres were past their sell-by date (something he excepts himself). It could be argued that with a championship to win he should have played more of a percentage game, especially given the identity of the man he was up against. Then again, it's hard to imagine any F1 driver meekly surrendering a place in that situation. This all gave us the warm tale of Michael Schumacher finally getting his first podium finish since returning to the sport with third place, some well deserved luck for the great man in a season were he's been bereft of any fortune before today (unfortunately, at the time of writing his place is under threat due to alleged use of DRS in a yellow flag zone). And then Mark Webber followed him in in fourth, a fine achievement on a day on which he started in 19th and none of his strategy moves seemed to work out for him. But the biggest star of the show was Fernando Alonso. Combative, tigerish, brilliant. A man for whom all his considerable talents were on show today in front of his adoring compatriots. 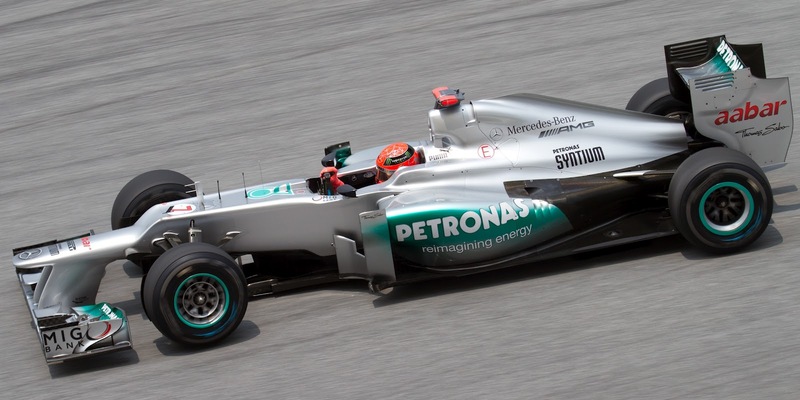 And a man who against all expectations is looking like the one to beat for the 2012 F1 World Championship. UPDATE: A couple of updates. One is, Schumi didn't get a penalty for the DRS under yellow issue, as it was demonstrated that he indeed slowed significantly for the yellow flag. And Maldonado got a 'post-race' drive though penalty for the Hamilton clash, and thus finishes 12th rather than 10th. His team mate Bruno Senna instead picks up the final point.